Dry macular degenerationWet macular degeneration occurs when abnormal or leaking blood vessels grow underneath the retina in the area of the macula. These changes can lead to distorted or blurred vision and, in some cases, a rapid and severe loss of straight ahead vision. 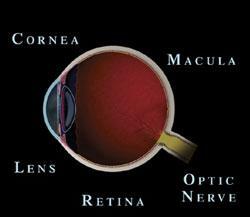 Please go to Patient Forms to download the Amsler Grid test and receive instructions on how to test your vision at home.Your eye doctor can identify changes of the macula by looking into your eyes with various instruments. A chart known as an Amsler Grid can be used to pick up subtle changes in vision.